St. Joseph’s Ace Lizette, left, intercepts a pass in front of Greenwich receiver Jael Negron in Saturday’s Grip It & Rip It tournament in New Canaan. NEW CANAAN — It began with four football teams in 2008. 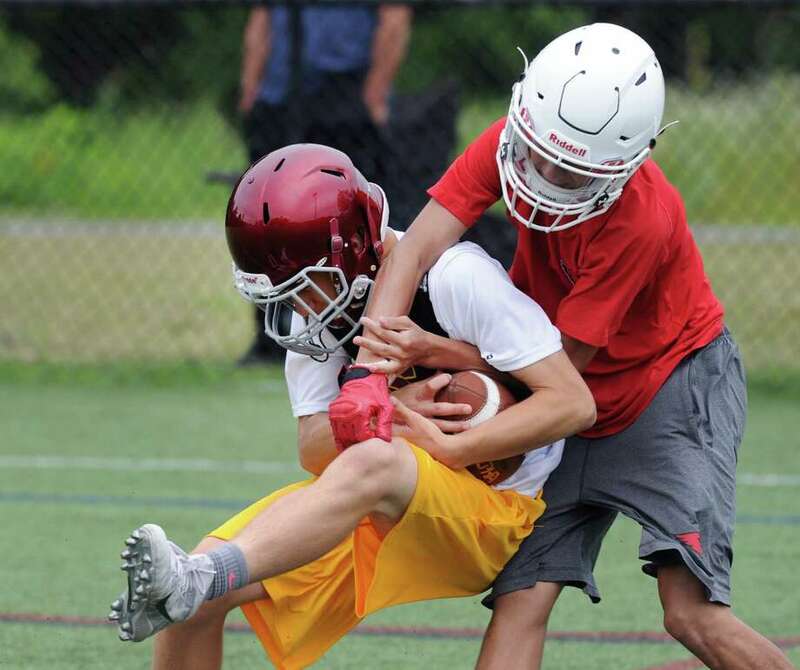 Now one weekend every summer New Canaan High School is littered with teams from across the region looking to hone their skills in the passing game. The 2016 edition of the Grip it & Rip it Tournament at New Canaan High School attracted 32 teams, which battled it out in a double elimination tournament Saturday after participating in pool play Friday. It was an all-prep affair in the finals as Brunswick, Cheshire Academy and Choate battled it out for the title. The Bruins knocked off top-seeded Choate before falling 30-24 to Cheshire Academy in overtime. All squads played four games during pool play as games were played in 22 minutes with a running clock on a 40-yard field. Rams coach Lou Marinelli was more than pleased with how the event — which was trimmed from 40 teams last year — played out. The FCIAC and Class LL champion Blue Wave were the final FCIAC team standing Saturday. After dropping a matchup to Greenwich in the quarterfinals of the winners bracket, the Blue Wave rebounded to topple the Cardinals and reach the final four. Darien (4-2) then faced Choate in the finals of the losers bracket and nearly upset the prep power. The Blue Wave held the ball with seconds left trailing by one point, but a late interception gave Choate the victory. Town rivals Greenwich and Brunswick found themselves pitted against one another in the semifinals of the winners bracket, with the Bruins coming out on top. That set up a rematch with Darien for Greenwich. The Cardinals jumped out to an early lead on the Blue Wave, who rallied to win 25-22. There were several hotly-contested passes as the competitive streak of both teams came out with the clock winding down. The Rams (3-3) fell to Stepinac (New York) in the quarterfinals of the losers’ bracket. A win there would have set up a matchup between Darien and New Canaan. “We tried out a lot of kids and got to see a lot of kids, which is good,” Lou Marinelli said. New Canaan fielded several quarterbacks over the two days looking to take over the starting job from departed senior Michael Collins. Seven FCIAC squads were represented among the field of 32, while eight arrived from New York. The furthest traveled more than 450 miles from Canada. CSC champion Harding went 4-2 in knockout play to crack the top 10. The Presidents topped Stamford, Bullard Havens, New Milford and Shenendehowa (New York) on their way. Due to CIAC rules, coaches were not permitted to coach their teams during the tournament. There were no such restrictions for the prep schools.